Residents in this coastal subsistence farming region of eastern china are exposed to high levels of carcinogens in their food and the air they breathe. This puts them at increased risk for various cancers. Broccoli sprout extracts were fed to healthy volunteers in four separate trials. Results support the idea that we can reduce specific cancer risks by a dietary approach. 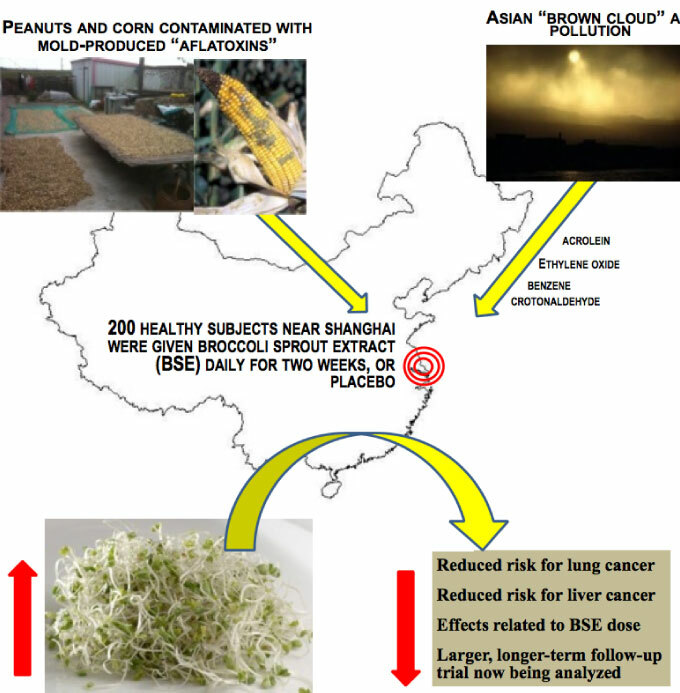 With increased broccoli sprout intake, excretion of air toxin metabolites increases, and markers of aflatoxin (food toxins) damage to DNA go down, thus presaging decreases in both lung and liver cancer respectively (and other chronic damage to those organs).